We flew to India for a two-week trip. A trip that’s considered relatively short for a country like India, but we really felt like visiting there again. Since we had little time to plan the trip, we decided to use the services of our friend Noam, who works planning private trips to India (Noam’s website) and to cooperate with him on the trip. We chose Rajasthan because December is the ideal month to travel there in terms of weather. We experienced a high standard trip that included a private driver, 4-5 star hotels and guides at every destination we went through. We started our trip in Agra and from there we continued to Pushkar, Jaipur Delhi and Rishikesh. 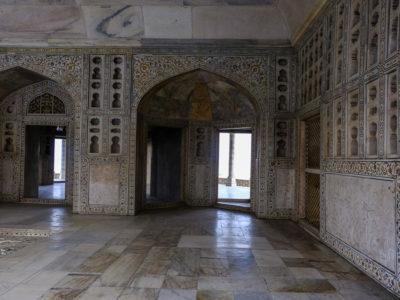 Agra is famous mainly because of one of the most impressive places in India, and in the world in general – the Taj Mahal. 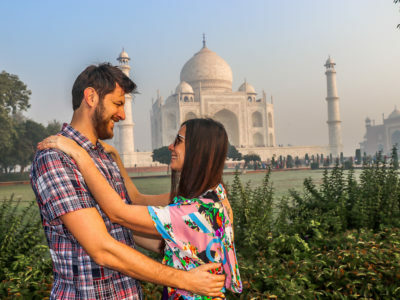 We have come to Agra especially for this site, but we also spent the night there and the truth is that if you have time for a trip, I would recommend spending a night or two in the city because beyond Taj Mahal there are several other attractions worth visiting while staying in Agra. 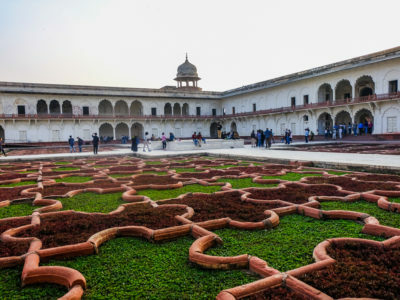 How to get to Agra? We flew on a direct flight to Delhi with Air India, which took us seven hours. From the airport, the private driver picked us up and we drove directly to Agra. This is a ride of about 5 hours. When I was traveling in India after the army, I traveled with a friend on a tourist bus from Delhi to Agra to visit only the Taj Mahal. 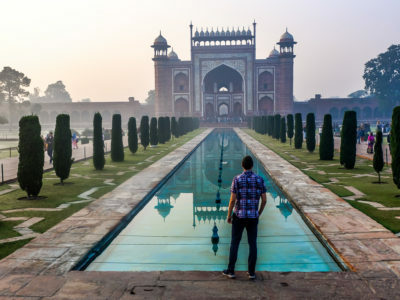 I personally think it’s better to get there the night before with a private driver / bus / train from Delhi because it’s better to visit the Taj Mahal early in the morning. We got there at a quarter to seven in the morning and it was a different experience than arriving at noon. 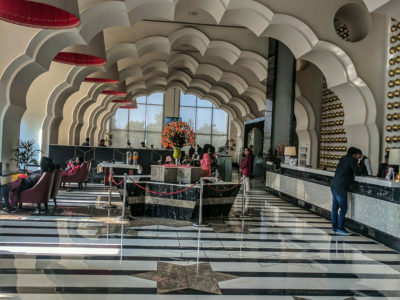 We slept in the charming Hotel Ramada Plaza Agra, a 5-star hotel. 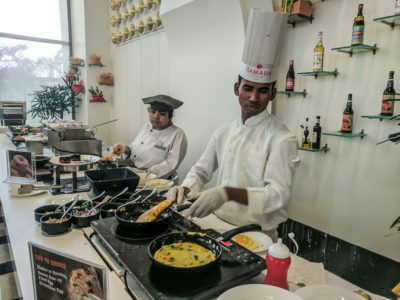 We did not get to enjoy it much, as we were only there for one night, but this is a high-class hotel, with a clean and comfortable room and a varied and tasty breakfast (Indian and Western options). A drive from the hotel to the Taj Mahal is around 20 minutes by car. You can reach the hotel the day before and take a taxi or a rickshaw to the Taj Mahal in the morning. If you’re fans of authentic local food (like we are) then outside the hotel are plenty of local restaurants. 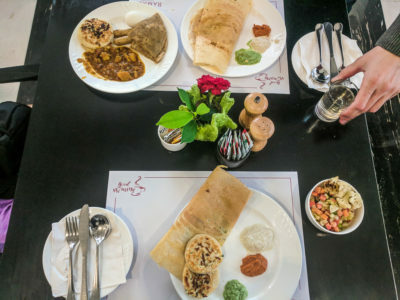 Note that these restaurants are mainly local, and you will hardly find any westerners there. 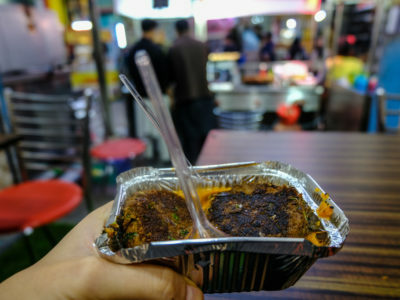 The food is relatively spicy, but we personally like the spice and prefer eating street food or at simple local restaurants on there trips. Anyway, we sat at a restaurant on the right side of the hotel. 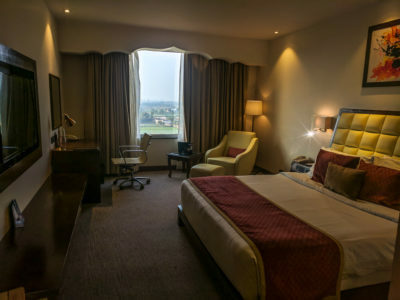 Ramada hotel price comparison. 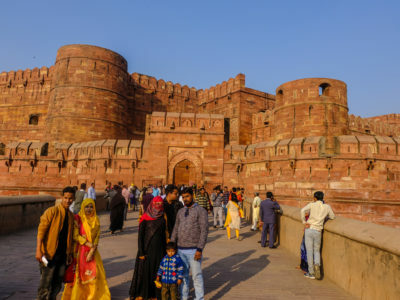 We did not get to do too many things in Agra, but it was still really nice there and it is definitely a city to visit if you are going on a trip to Rajasthan. So, as I mentioned before, the Taj Mahal is one of the most famous places in India and every day tens of thousands of people flock there. Since so many people go there, I personally recommend visiting in the early morning hours. 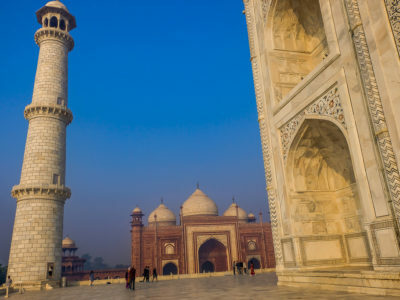 The Taj Mahal is a marvel of Mughal architecture, with influences of Islamic, Iranian, Persian and Indian styles. It was built between 1631 and 1653. 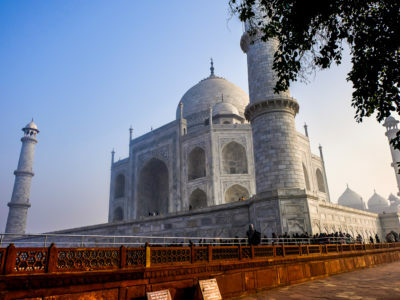 The Taj Mahal was able to survive throughout history without suffering damage, which makes it possible to admire it today just like when it was built. There are many prohibitions on things that can be brought with you when you visit the site. Since this is a long list of prohibitions, I will focus on what is permitted. A cell phone, a camera, glasses and a wallet are allowed. That’s it! So, if you come directly from the hotel leave everything behind and bring only those things with you. If you have more equipment on you, it’s possible to put things in storage, but this is done before entering the site! It is very important to know this, because if you do enter with things on you – after a long queue, security will discover prohibited items on you, and your only options will be to throw them away or leave the queue and put them away in storage and go back to the end of the line (the queue may be very long and there is a comprehensive personal check). 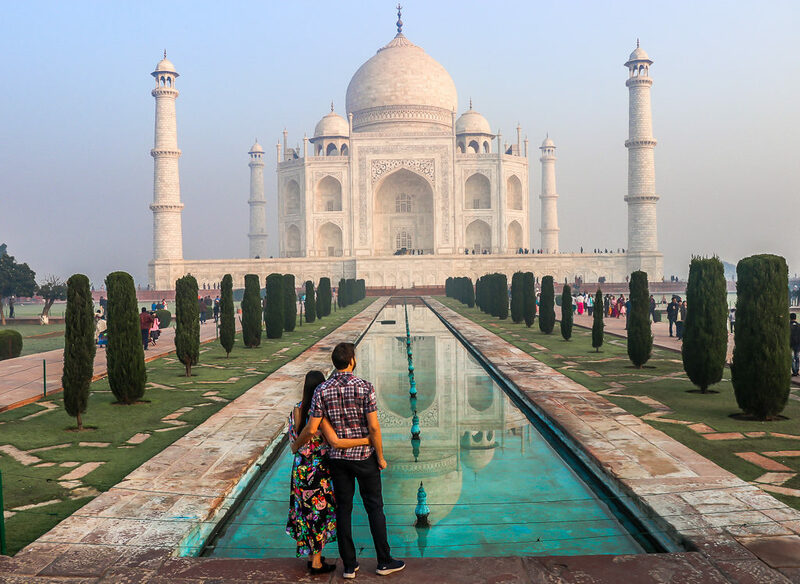 In addition, if you are into photography and want to have nice pictures from your visit to the Taj, then the first thing I would recommend is to invest in the clothes you come with and there is also the possibility of renting a photographer at the entrance. There are many photographers who offer their services, and they all have the same prices and are on about the same level. I will say that they are not at the highest level, but I suggest looking at pictures of others on Instagram in advance to get inspiration for what photos you want, and even show them to the photographer. In addition, we had a personal guide and he served as a mediator between us and the photographer, which really helped. Hiring a photographer costs around 250 NIS or more (depending on how many pictures you want). 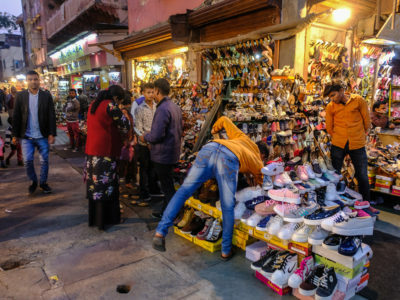 If you really want to have a high-quality photographer with you, then you can look for a photographer in advance, but take into account that the prices are much steeper and there are also charlatans (because you need a license to take pictures at the Taj, which he may not have), so make sure you find a photographer with recommendations. There is a walk of about 10 minutes between the entrance to the site and the main gate. It is possible to get a rickshaw at the cost of a few shekels or simply walk. 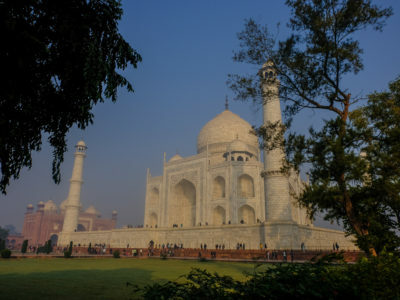 We arrived there with a personal guide, which in my opinion improves the experience, since the history of the Taj Mahal is interesting, and this expands the experience. There is also the option of hiring a guide at the entrance. 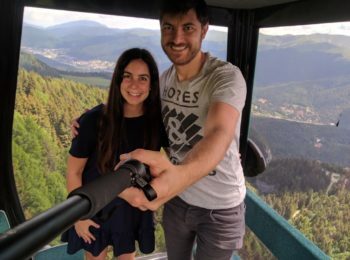 If you do not come with a guide and want to rent one there, talk to him beforehand and make sure that you understand his English and that you have a good connection with him. 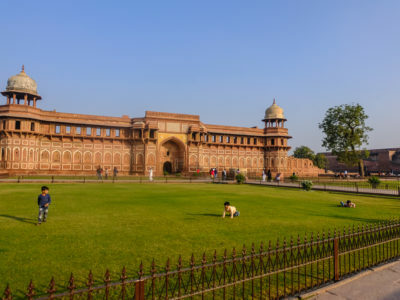 We went to Agra Fort the day before the Taj Mahal visit and I think this was a good way to round out the experience. 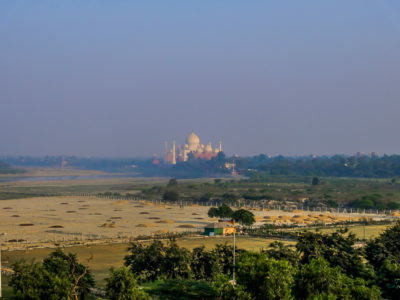 From the fortress you can see the Taj Mahal from a distance. 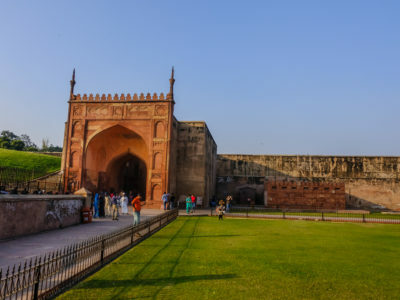 The fortress is built of red sandstone and it was built gradually by three rulers of the Mughal Empire. 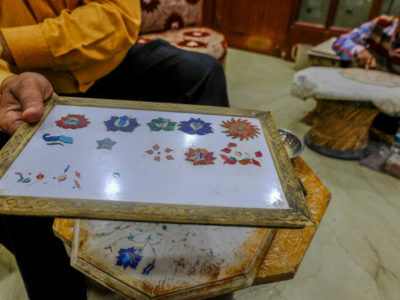 Each ruler had a favorite design style and you will therefore see various styles of architecture and art at the fortress, such as sandstones and colorful tiles, white marble with stone inlays and polished plaster. In 1983 UNESCO granted the citadel the status of a World Heritage Site. We came to the fortress accompanied by a guide, as well, and again I think it adds to the visit. The fortress is really big and without a guide it is hard to understand what the meaning and the story behind each part of the fortress is. After the visit to Agra Fort we went to a local market. 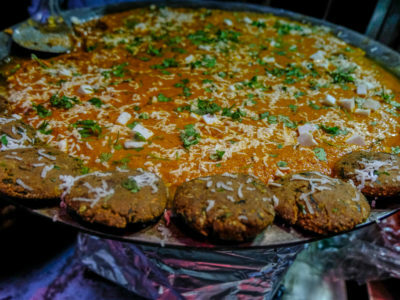 Since we like eating street food, we wanted to try some local dishes. There are also souvenirs, clothes and shoes at the market, but we mostly went around the local food street and tried a few dishes (Map). If you are fans of local art, then this store will surely impress you. 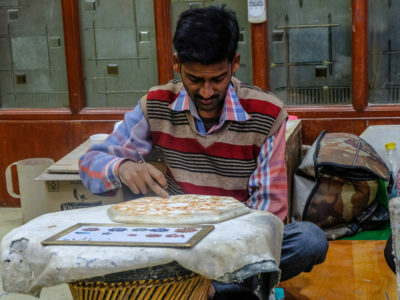 This shop makes art pieces and furniture out of marble (Rigorous work in which it takes two people a whole month to make a marble platter the size of one plate, and they import the stones they work with from different places around the world). It is possible to purchase the art there and have them send it to your home. Prices are relatively expensive, but it is a crazy investment in any product and if you are only looking for a souvenir then there are options for smaller items at cheaper prices (Map).